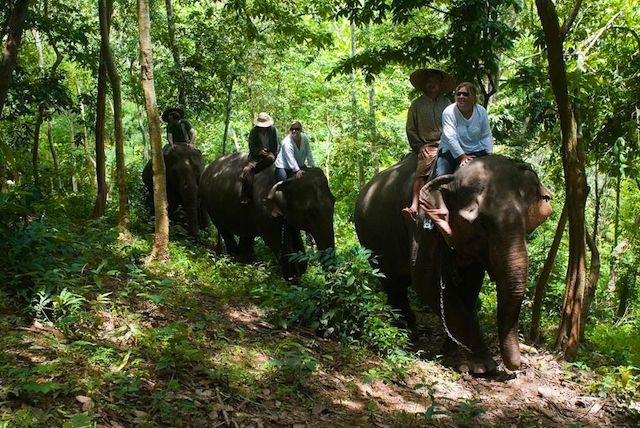 In this full-day trip, you will ride an elephant through the jungle. Firstly take a turn feeding these majestic giants as you learn about their behavior from a local Mahout, then hop on for a 1.5-hour elephant ride through a teak forest, trekking over hills to the protected Huay Sae Valley, where you’ll have lunch with wine, hike alongside a mountain stream and take a bamboo raft on the Nam Khan River. Pick up at your hotel in Luang Prabang and transfer by car to a base camp outside of town. From here, your adventure begins in the Lao wilderness: riding elephants, trekking and canoeing. Start your expedition by feeding elephants at a local animal hospital where a veterinarian shares knowledge of elephant behavior and answers any questions you have. Once you’re comfortably settled atop an elephant, embark on your 1.5-hour trek, riding through teak forests and over hills to reach the remote Huay Sae Valley. Take in the lush landscape of this prime jungle until you reach a secluded waterfall, where you can swim in the natural pools (depending on the water level) and enjoy your picnic lunch with sticky rice with Lao specialties such as lab mou (minced pork with spices and chili), aor larm (stewed meat with spices), fried mixed vegetables and crispy fried fish, among other options. From here you’ll continue your trek on foot, hiking for approx 1.5 hours alongside a marvelous Huay Sae mountain stream. Hike with your guide on this adventurous trail, crossing bamboo bridges and passing picturesque waterfalls that peek from dense jungle. Where the trail leaves the valley, traditional horses from a Hmong hill tribe can carry your group’s day-packs along a more demanding uphill section through forests and fields. When you reach the shores of the Nam Khan River, a beautiful bamboo raft is waiting to take you back to the base camp. Float slowly downstream on a relaxing 1.5-hour journey on this gentle river as you absorb views of traditional Lao village life along the riverbanks. Transfer by car back to your hotel in Luang Prabang. End the trip.